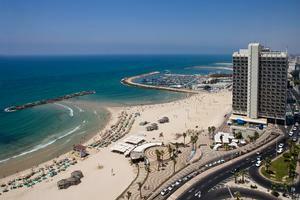 The Renaissance Hotel Tel-Aviv offers the Best location in Tel Aviv. ALL rooms with sea view. Indoor heated pool,Jacuzzi,Turkish bath, Finnish sauna, fitness center for recreation. 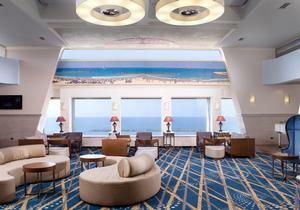 Lobby and Jaffa Terrace for light meals and beautiful sunsets. 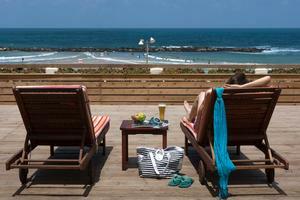 Whether business or pleasure, there is no better combination than the Renaissance Tel Aviv. Part of Marriott Lodging International.Club rooms on high floors entitle guests to entrance to Renaissance Club Lounge (adults only)serving refreshments and snacks free of charge, as well as free use of fitness room. Max 2 people in Club rooms. 'Marriott Rewards' apply. For 2 adults + 2 children in comfort rooms, take 2 rooms with the charge of single rate B/B per room. Hugged by a fine white sand of the beach from one side and Tel Aviv’s business, culture and nightlife from its other side, guests and visitors alike marvel at majestic views of the deep blue Mediterranean Sea and neighboring ancient Jaffa. "All great. One tip- there should be a sign informing guests to bring money to beach to pay for ..."